From the Planes You’ve (Probably) Never Heard Of Department of Wingspan, we bring you the Saunders Roe SR.53. Strategic bombing got its baptism by fire in the First World War, and in 1932, British politician and eventual three-time Prime Minister Stanley Baldwin made a speech to the British Parliament in which he famously said, “The bomber will always get through.” In the Second World War, strategic bombing was used to level entire cities and kill tens of thousands of non-combatants, demonstrating that yes, the bombers always got through, but often at a heavy cost to the bombers and their crews. The doctrines of strategic bombing changed little when the world entered the Nuclear Age in 1945, but, with the advent of the nuclear bomb, only a single bomber need get through to devastate a city. Stopping these bombers—all of them—became a paramount concern in the era before antiaircraft missiles. But to stop the bombers, you had to get them before they could loose their weapon. And to do that, you needed a very fast interceptor. During WWII, the Germans experimented with rocket-powered interceptors such as the Messerschmitt Me-163 Komet. This stubby rocket plane could fly faster than any fighter, but once its fuel was spent it became a defenseless glider. The solution to this problem was the development of mixed propulsion interceptors, where a rocket motor would power the jet for takeoff and rapid climb while a jet engine would bring the interceptor home. Saunders Roe was a company that had made a name for itself by building flying boats, but had also been carrying out research into high altitude, high speed flight. In the Spring of 1951, they proposed the SR.53, an interceptor that boasted both a rocket motor and a turbojet engine. 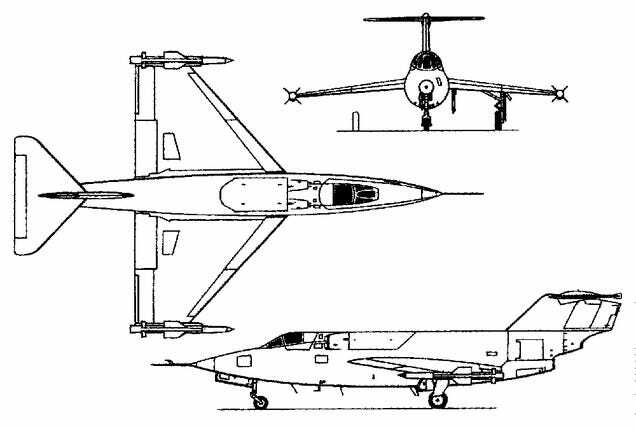 The SR.53 was an advanced design, with delta wings and a T-tail outfitted with a moving tailplane, or stabilator, for control during transonic flight. It was powered by an Armstrong Siddeley Viper turbojet fed by small air intakes behind the cockpit for traditional flight, and a de Havilland Spectre liquid-fueled rocket engine with two exhaust nozzles placed below the jet exhaust. Saunders Roe predicted that the rocket could propel the SR.53 to speeds above Mach 2 to an altitude of 67,000 feet, and it could reach 50,000 feet in just over 2 minutes. It would be armed with two de Havilland Firestreak heat-seeking missiles on the wingtips, but no internal guns. The Air Ministry ordered three prototypes, and the first, XD145, took its maiden flight on May 16, 1957, followed by the second prototype, XD151, seven months later. By all accounts the SR.53 was a solid aircraft, and pilots reported favorably on its flying characteristics, calling it “an extremely docile and exceedingly pleasant aircraft to fly, with very well harmonized controls.” Saunders Roe felt good enough about the design to propose a much larger and more capable interceptor, the SR.177, but history was not on the side of Saunders Roe. The maiden flight of the SR.53 came just one month after the publication of the 1957 Defence White Paper which called for the abandonment of British efforts to develop high-speed interceptors in light of the advent of antiaircraft missiles and improved long-range radars (the English Electric Lightning would be the last British interceptor of its kind). Development of jet engine technology had also led to the afterburner, or reheater as the British called it, meaning that rocket engines were no longer required to quickly intercept incoming bombers. In light of these technological advances and the controversial changes in defense doctrine, the SR.53 was canceled in July 1960, and work on the third prototype was halted. By this time, a fatal crash had claimed the second prototype, and the sole remaining SR.53 was shelved and now resides at the Royal Air Force Museum Gosford. The SR.53 was the last fixed wing aircraft to be built by Saunders Roe, and the company became defunct in 1964 when it merged with Westland Aircraft.